The fascist prosecutor who stated at Gramsci’s incarceration that he wished to stop the brain of the accused from functioning for twenty years would probably be ashen-faced had he lived to see the seemingly endless number of new studies published about his courtroom antagonist. The ongoing fecundity of the Gramscian paradigm is amply demonstrated in this formidable collection of essays focused on historical and contemporary aspects of the oeuvre of the sage of Sardinia. Frank Rosengarten’s posthumously published essays represent an emphatic vindication of the value of Gramsci’s philosophy of praxis, both to unearthing new light on historical processes and to facilitating a re-orientation of the revolutionary project of the left in the 21st century. This collection represents one of most fruitful additions to Gramsciana since the publication of Peter Thomas’ ‘The Gramscian Moment’ in 2009. The author upholds a similar aspiration to shake off the weather-beaten caricature of Gramsci as the non-insurrectionary icon of Western Marxism and the intellectual justification for reformist electoralism. For too long, the author justifiably asserts, ‘left periodicals published during the last ten to fifteen years have tended to downplay his connections with the makers and events of the Bolshevik Revolution and to privilege those aspects of his ideas that fit into the framework of what has been loosely called cultural radicalism’ (15). Rosengarten shares Thomas’ path-breaking reconfiguration of Gramsci as more than the philosopher of the superstructure as he was characterised by influential post-war interpreters. Thomas re-emphasised Gramsci’s notion of the integral state, in which civil society, politics and the state are symbiotic spheres of capitalist hegemony. The significance of one over the others in terms of sustaining the ruling class in power can vary according to situational dynamics. This nuanced perspective permitted Gramsci to rise above the economic determinism of the Second International. After his death, however, it was twisted into an excessive focus on ideological activity by the electoral opportunism of the Italian Communist Party that was seeking to display its non-revolutionary credentials to the country’s ruling class in the aftermath of World War Two. The wider consequence on the international left was the propagation of a sanitised Gramsci who became ‘a kind of role model to many radical intellectuals, academic Marxists and left-leaning social democrats’ (15). Rosengarten’s explicit purpose in this volume is to restore Gramsci to his rightful place in the revolutionary milieu of the Third International of the 1920s with its unwavering commitment to the necessity of a coercive toppling of the capitalist state. The author opens his collection with an insightful and corrective account of Gramsci’s political relationship with the two pre-eminent figures in the history of Bolshevism. The non-revolutionary apologists for the tactical twists and turns of the post-war PCI sought to shape an interpretation of the Sardinian as a more palatable alternative to the Marxism of Lenin and Trotsky, which they argued was irredeemably tainted by the bureaucratic deformation of the USSR. 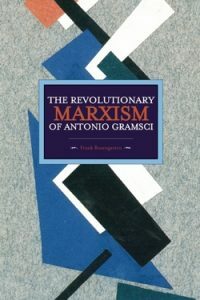 Beyond Italy, this anti-Bolshevik reading of Gramsci would become the most influential one in the academies and leftist forums of Western Europe and North America, sustaining the still pervasive notion that he rejected the role of force in politics and advocated a purely ideological form of struggle. In support of Peter Thomas’ critique of this prevailing interpretation, Rosengarten boldly re-asserts Gramsci’s crucial intellectual lineage with the founders of the world’s first workers’ state: ‘New Left emphasis on the anti-authoritarian content of Gramsci’s socialist project to the exclusion of his tough-minded, resolute stands from 1917 to the 1930s in defence of the Bolshevik Revolution is matched in its one-sidedness by the arguments of Eurocommunists and groups to the left of Euro communism’ (16). Rosengarten recounts how Gramsci’s seminal concept of hegemony was not formulated, as is commonly believed, while the thinker was secluded in the unwelcome isolation of Mussolini’s jails in the 1930s but was forged in the revolutionary crucible of the previous decade. Prior to his incarceration in 1926, Gramsci spent eighteen months in Moscow as an Italian delegate to the Comintern, participating in intense discussions with Lenin and Trotsky on the nature of socialist organisation and with a specific focus on the nature of revolutionary change in the advanced capitalist states. The author underlines that it was these interchanges with the leading figures of the Bolshevik state that led Gramsci to formulate his defining conception of the revolution in the West as being a distinct phenomenon from that of its Eastern counterpart. Contrary to the myth makers of the electoralist left, however, Rosengarten explores Gramsci as devising his distinctive theoretical contribution in collaboration with Lenin and Trotsky, and certainly not in opposition to them. The author asserts that ‘the idea that the conquest of power by the proletariat in the countries of Western Europe would require a strategy significantly different from the one followed by the Russian Bolsheviks was due not only to the teachings of Lenin but in some measure also to the various speeches and writings Trotsky devoted to aspects of the Italian situation in 1921 and 1922’ (29). In this regard, Rosengarten echoes recent studies of Lenin by Paul Le Blanc, Tamas Krausz and others that have emphasised the subtlety and nuances of the Russian leader’s thinking concerning the specificity of revolutionary strategy and tactics. The author rejects outright the Eurocommunist notion that Gramsci and Lenin should be regarded as representing two distinct and irreconcilable paths towards socialism. He notes that ‘for the former Lenin was always the complete communist revolutionary, at once deeply rooted in the national traditions of the Russian people yet always aware of the international dimensions of the struggle to which he dedicated his life’ (18). The similarity regarding Gramsci’s outlook with that of Trotsky, Lenin’s foremost collaborator, is no less striking. The author identifies five areas in which the thinking of the two men was closely aligned (23). The first was the aforementioned awareness by both that revolutionary strategy in the West could not be an unthinking duplicate of the model that succeeded in the East. Linked to this was their common promotion of the strategy of the united front, wherein reformists and revolutionaries should campaign together in the short and medium term with a focus on unifying practical objectives that take priority over deeper, theoretical differences. For both men, this was the pathway for the radical left to rebuild in the West after the ebbing of the revolutionary wave of 1917. Rosengarten repeats his conviction that the Eurocommunist attempt to separate Gramsci from Trotsky and other key figures in the Comintern is misconceived: ‘Let it not be forgotten that it was Trotsky who taught Gramsci something of what he knew about revolutionary tactics and about the general conditions governing political struggle in the West as opposed to the East’ (41). Similarly, the two agreed that fascism represented a clear and present danger to the working class and that it should not be treated lightly by the organised left. Tragically, the prescience of this analysis was spurned by both the Italian and German labour movements, paving the way for catastrophic misjudgements by the left in the respective countries that facilitated the rise of Mussolini and Hitler. In addition, Gramsci and Trotsky shared a mounting concern throughout the 1920s about the growing power of the Communist Party bureaucracy in Russia, with both detecting an ominous drift of power away from the grassroots organs of workers’ democracy and towards the clique that would ultimately triumph under the aegis of Stalin. The two men also shared a conviction that aesthetic production in a socialist society should not be compromised or restricted by political calculations. Gramsci and Trotsky both wrote extensively, if separately, on matters of art and literature and intuitively sensed the disastrous effects of state supervision of artistic output (another chapter explores how Gramsci ingeniously used Dante’s portrayal of Hell to comprehend his own predicament in a fascist prison cell). Rosengarten notes that ‘Gramsci was aware of Trotsky’s efforts in this area, and that he was in some measure influenced by the emphasis that Trotsky placed on the relative autonomy of the moral, intellectual and artistic aspects of life vis-a-vis the political domain, cannot be seriously doubted’ (24). Regrettably, as the 1930s unfolded both would see their proclivity for the autonomy of art traduced by the cultural philistinism of Stalin in Russia and Mussolini in Italy. Having incisively accounted for common threads of outlook between the two men, Rosengarten addresses the inevitable question of why Gramsci publicly spoke out against Trotsky in the power struggle within the upper echelons of the Russian Communist Party and even more surprisingly, how the former came to see Stalin as representing the best option for the future of the Soviet state. The author’s solution to this troubling conundrum is persuasive, if sobering, and revolves around Gramsci’s fears in the late 1920s that the rise of fascism in Italy, and later in Germany, necessitated the imposition of an equally iron grip on the steering wheel of what he still regarded as a workers’ state in Russia. Rosengarten sums up Gramsci’s pragmatic assessment of the Stalin-Trotsky rivalry: ‘Issues of principle tended to assume secondary importance in comparison with the immediate problem of survival that faced the communist movement everywhere, in the USSR itself, and above all in countries like Italy, where fascist reaction threatened to obliterate the advances made by the Italian working class parties’ (35). In another stimulating chapter, Rosengarten compares Gramsci with the one of Trotsky’s most notable followers, the Caribbean Marxist, CLR James (131). The author draws attention to intriguing commonalities shared by the two revolutionary thinkers, such as their personal origins on islands controlled by a greater power (Sardinia and Trinidad); their journeys as young men to the industrial heart of the imperial power (Turin and London); and their shared conviction that Marxism must be sensitive to the nationalist consciousness of oppressed groups if it is to retain relevance in specific contexts (Sardinian nationalism and black nationalism). Rosengarten observes that the two figures experienced and sought to theorise the consequences of the defeat of the revolutionary wave initiated by the October Revolution. Although they wrote in vastly differing circumstances and locations (and James would outlive Gramsci by over five decades), they were united in the project of attempting to salvage the remains of an authentic Marxist tradition in the face of persecution in the age of dictators. As noted above, Gramsci made his peace with the Stalinist regime for pragmatic reasons, but Rosengarten maintains that had he survived Mussolini’s prisons, the Sardinian would have come to acknowledge many of the criticisms made by both Trotsky and James concerning the distorted nature of the USSR (127). At a philosophical level, both thinkers sought to re-energise the creative and humanistic impulses of Marxism which they sensed were being eroded by the mechanistic caricature emerging out of Russia in the 1930s: ‘In this sense, it is no accident that they were both mindful of Marxism’s Hegelian origins, not in order to deny the relevance of the materialist turn taken by Marx but rather to insist on the dialectical vision of life that Hegel transmitted to Marx, a vision that integrates subject and object in a totalising synthesis’ (128). Gramsci and James, at various points in their lives, shared the predicament of struggling to maintain revolutionary convictions in hostile and unsympathetic environments. The situation of revolutionaries in the West in the 21st century is thankfully not as dire as that confronting the former in the last decade of his life. However, as the one hundredth anniversary of October approaches without the imminent prospect of an equally spectacular breakthrough, it is unsurprising if some on the left abandon altogether the hope of living to witness a comparable event. Rosengarten urges his readers to resist such defeatism, partly based on the inspirational example of his subject who retained political integrity right up to his death in a fascist prison (117); but also with an appreciation of Gramsci’s image of the ploughmen and the fertiliser, as recounted in the ‘Prison Notebooks’ (112). The former symbolises those rare generations of revolutionaries, such as Lenin and Trotsky, who are able to participate directly in a battle for power with the ruling crisis during a massive societal crisis. Such opportunities, however, are impossible without the groundwork being prepared over a long period of time, and often in conditions of apparent futility, by previous generations of socialists acting as ‘fertilisers’.